WASHINGTON — The tale has inspired ample political commentary, and more than a few columns for the New York Times’ Gail Collins. Now, the story of Mitt Romney’s former dog Seamus could start becoming a profit-maker. A new book, “Dog on the Roof! 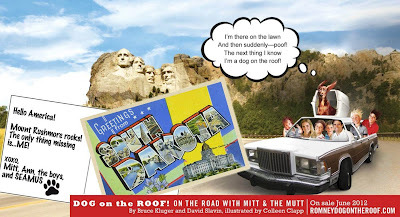 On the Road with Mitt and the Mutt,” is being released next month by the reputable publisher Simon and Schuster. The book depicts the Romney family — using early photos of Mitt, his wife, Ann, and their five boys — crammed into a station wagon with a dog atop it. The family is shown driving to cities around the country as the authors use sing-song verse to lampoon Romney’s positions on immigration, gay rights, his ties to Wall Street — and the fact that he once drove to Canada with his dog in a container on top of the car. via Mitt Romney’s dog Seamus inspires new tale – Political Intelligence – A national political and campaign blog from The Boston Globe – Boston.com. Wednesday Woof – Great Pic! House Speaker John Boehner told CNBC that he would move legislation to extend the current tax rates for another year. The so-called Bush tax cuts were extended once already but are due to expire at the end of the year. via Boehner Will Try to Extend Bush Tax Cuts for Another Year. You Can’t Strap The Big Dog to the Roof! Former President Bill Clinton warned Tuesday that a Romney presidency would be “calamitous for our country and the world.” “The Republican Congress and their nominee for President, Governor Romney, have adopted Europe’s economic policies,” Clinton charged. “Their economic policy is austerity and unemployment now, and then a long-term budget that would explode the debt when the economy recovers so the interest rates would be so high, nobody would be able to do anything,” Clinton said. via Clinton: Romney president ‘calamitous,’ Republican economics ‘crazy’ – ABC News. Seamus Romney’s story goes to print – Remember Seamus! Perhaps it was only a matter of time given the story’s staying power, but the tale of Seamus and his famous ride on the roof of the Romney family car is about to be immortalized in literature. “DOG ON THE ROOF! On the Road with Mitt and Mutt” debuts June 19. The illustrated book chronicles the car trip that launched an advocacy group and a decade of irritating questions for Mitt Romney. via Seamus Romney’s story goes to print | Washington Examiner.